Modern Bright Pink Christmas Button Badge. 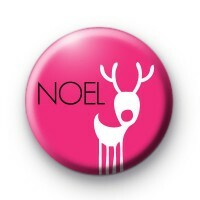 This Xmas badge is a bright bold pink with a festive white reindeer and NOEL wrote in a simple black font. We have quite a few more modern festive designs in the shop as well as your more traditional Christmas badges - both of which are popular during the festive period. Our Festive badges are great to give out to Teachers, Students and friends this Christmas to spread a little Xmas Cheer & we have over 600 Christmas designs in the shop and their all handmade by us in the UK.